Upcoming shows and a little cuteness! We are going to have a very busy September! I really hope that some of you can come to see us at a show - it's always really fun to meet people in person that we've gotten to know online! This is the first time for us to vend here, and it's my understanding that this is a new location for the show - so if you live in the area, make sure you go to the Fairgrounds! Next up is a show in Walker, MN on September 22nd and 23rd. This show is put on my 2 guilds - the Northwoods Quilters and the Heartland Quilters. Hope you can come to one of them!! We will also be in Ft. Dodge, IA in October - but I will post the details on that when it gets closer. I have a week in between shows, and that is when the second "Surprise" box will be going out. I've got those almost ready to go. Then the charms will be mailed the last week of the month. Speaking of charms...have you signed up? The picture at the top of the blog is a sample of the charms and the details are on my website. It's always lots of fun, and don't forget that you get free stuff! My cute little niece started COLLEGE last week. I just can't believe she is 18 already. She is going to her local community college, which I'm happy about, I don't want her to move away! Here she is on her first day of college - telling her kitties goodbye - lol! And it's not the first day of school without Grandpa (my dad) seeing her off. My sister in law has taken a picture of them each year and they are sooooo cute. Many are the 2 of them from the back, walking down the driveway to meet the school bus, holding hands. Adorable! Look at my dad - can you tell he's a farmer?! He's quite the fashion statement with bibs and boots! I talked to her after her first day and it all went well. She also started a new job that day - so after a summer of leisure, she is a busy girl! Hope you have a leisurely Sunday! If you've been reading my blog for awhile, you probably know that my husband is a beekeeper. This will be his 3rd year already - boy, time sure flies. He enjoys doing it, and I like the harvest! Having our own honey is really awesome. I didn't realize how different every honey tastes, and now I can tell you that I am very partial to ours! I also love having the wax. We sell these in our booth when we vend - aren't they cute? These are new - a friend made these molds for us. We have these too. The little rosettes aren't as cute, but they really do work well to have in your sewing kit. I have one next to my stitching chair and use it when I'm hand quilting. I already shared this bee block, but since I'm posting about bees, I thought it should be included! Still no plan as to what I'm going to do with it = I really want to make a few more, and thanks to a couple of great online friends, I was able to get more fabric! We have named them Scissor Hives (thanks Nancy) and I am in love with them! The "hive" is a vintage spindle and is 3" tall. The scissors are a little less than that, and they are nice and sharp. Another necessary thing to keep by your stitching chair! These also make the perfect gift for any friend who quilts or stitches. We have them on our website and will be taking them to shows this fall. Speaking of the change of seasons, I've been making lots of pumpkin pendants. These are 1 14" and have a little bit of bling added. I finally finished this Welcome wall hanging - I bought it as a kit at The Woolen Needle a couple of years ago (again..where does time go??). I've had most of it done, just needed to put it all together and I finally did it last week! You can see that Callie is helping hold it down (wouldn't want it to get away). Now I better get busy (as a bee) because I don't want the day to get away from me! And this? It's adorable, but totally does not match my decor. I would be owning it, if it did! My friend who cut my hair for years used to sell Scentsy and always had a basket of the wax bars at the shop and I always felt the need to get some! Unfortunately she stopped cutting hair, and stopped selling Scentsy. Lucky for me, my friend Nancy is now selling it, and it's super easy to buy. You just go to her website and place an order! I always thought that you had to find someone who was having a party or find someone that you knew who was selling it. Nope - you just go to this website and order whatever your little heart desires. I think I'm going to break down and get that new warmer for my kitchen! And, while I'm at it, I better get another bar of my favorite scent - Welcome Home. Mmmm...it's a "fall" type of smell to me. Love it! What is your favorite scent? Have you gotten the new issue of American Patchwork and Quilting? It is a great one! Lisa from Primitive Gatherings is on the cover showing some of her amazing quilts. And inside? So many great projects! 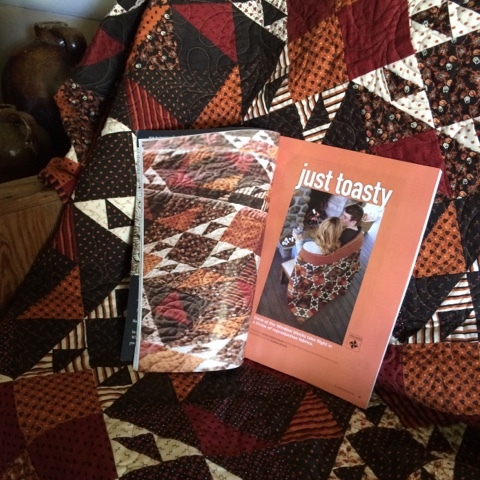 But the first one that I knew I had to make was Just Toasty by Betsy Chutchian. Take a look at these beautiful fabrics by Betsy and Moda. I actually ordered the kit from Betsy before I even had the magazine, because I saw a picture and just knew it was a winner. You can order one for yourself (you will not be sorry, I promise!) by e-mailing Betsy at bchutchian@hotmail.com. As soon as I got my kit, I just had to start cutting! Ozzie loves these new fabrics too! Can't wait to make more blocks. Did you order your kit yet? DO IT! What are you waiting for?!?! Lol! Seriously...they are so nice. I think we all love the fall season and this quilt will be just perfect. Bow ties, bees, and kitties! Do you follow Bonnie Hunter's blog? She is such a busy lady - travels all over the world teaching, offers lots of free patterns, a mystery quilt that is always awesome each year, and on and on. She also puts a leader/ender challenge out to everyone each summer. Three years ago the block was bow ties. I have never been a big fan of bow tie blocks, but for some reason it seemed like a good idea! Honestly, I don't work on these very often (obviously, or this would have been done 2 or 3 years ago!) and I don't have much opportunity to use leaders and enders, because I'm usually working on jewelry and it just doesn't work for that. I decided to start laying out some of the blocks to see what colors I still need. I have no idea what size this is going to be, but I have almost 900 three inch blocks made so far. That sounds like a lot, but what you see here is 144 blocks! You will have to turn your head for this one, it doesn't seem to want to cooperate. I've made tons of kitty pendants lately - these went with me to Kansas last week, and not very many came home, so I'm back to making kitties again. I drug out all of my bling making stuff - really wish I had a space where I could leave this out - why didn't we make my sewing room bigger!? Usually the cats think they have to lay in the middle of all of this, but they left it alone this time! I've sold tons of bees too - these are all sold, and more are in the works. I posted them on Instagram asking if anyone had any of the gold or black honeycomb fabric, and a few awesome people came through for me - quilters are just the best! I have a couple different people sending me some of the gold, and I think I know where I can order some of the black. I heard that Moda is going to re-print this line (Bee Creative by Deb Strain), so hopefully I will be able to get some more of it in the future. I want to make a cute bee wall hanging out of this fabric - that is what I originally bought it for, but then bee necklaces took over! I'm going to have a new, fun item to show you soon (if you were in my Charming club, you got to see it early!) - will post a picture as soon as they get here.